"THE NATIONAL DAY OF PRAYER"
but for the Book we could not know right from wrong. "I hear the voices, and I read the front page, and I know the speculation. But I'm the decider, and I decide what is best. And what's best is for Don Rumsfeld to remain as the secretary of defense." - Pres. George W. Bush. President Bush's recent remark, "I'm the decider", has brought a light hearted amusement lately, and I think I may understand why. There's a certain, innocent humor about that kind of candid and confident authority, that causes reaction in people. It reminds me of the time my toddler waved his arms up in the air when he was reprimanded and proclaimed dramatically, "I take the orders!" And there's an astonished awareness, of an impenetrable and admirable confidence that defies and discourages challenge. we mutually pledge to each other, our lives, our fortunes and our sacred honor." - The "Declaration of Independence"
"PRESIDENT LINCOLN'S PROCLAMATION FOR A NATIONAL DAY OF PRAYER" . "We have been the recipients of the choicest bounties of heaven. We have preserved, these many years, in peace and prosperity. We have grown in numbers, wealth and power, as no other nation has ever grown. But we have forgotten God. that all these Blessings were produced by some superior wisdom and virtue of our own. too proud to pray to the God that made us! the "Teachings of The Redeemer of mankind". our civilization and our institutions are emphatically Christian... This is a religious people. to the mass of organic utterances that this is a Christian nation." In this present day, the sanctity of human life is the priority issue. It covers the entire spectrum of threats to human life, including abortion, infanticide and euthanasia. The Bible speaks strongly to our responsibility toward the spilling of innocent blood. don't stand back and let them die. Don't try to disclaim responsibility by saying you didn't know about it. and He Knows you knew. And He will Reward everyone according to his deeds. "Posterity- you will never know how much it has cost my generation to preserve your freedom. As President Lincoln himself advised, the United States of America's caring people should confess to GOD the sins committed by this nation. Then pray for His Forgiveness and Mercy, helping to bring about a national movement of prayer, repentance and faithfulness to His Laws. the nature of GOD and spiritual nature and need of men. "Lastly, our ancestors established their system of government on morality and religious sentiment. Emphasizing the Power and Joy of The Resurrection of Christ - and Unity For Mankind..
with GOD's Love and Peace." - Pastor Gerry M. Kaye. | Thank you for coming! 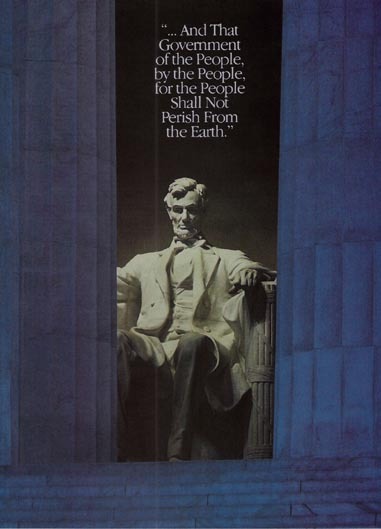 "The Rebirth of America" Publisher - The Arthur S. DeMoss Fndn. "The Son": CHRIST, MORE THAN CHRISTIAN"
"A National Movement Of Prayer"
"May 16, 2006 Prayer Across America"
"Celebrating Freedoms & Service In The U. S. A." Find Help In Scripture -"HelpInTheWord"
"GerryBlog" - Telling It like It Is! Kindly Send an Email of Gratitude & Greeting To Our Troops. Featured: A Prayer For "The BELOVED & The BRAVE"
"A Prayer and A Message" - You do us proud! A PROCLAMATION BY President GEORGE W. BUSH: "NATIONAL SANCTITY OF HUMAN LIFE DAY"
"PURPOSEFUL QUOTATIONS, THEN AND NOW"
"Ministerial Speeches" Abraham Lincoln "The Gettysburg Address"
"Let us all united, stand for Light & freedom in our land, and for all nations ... ."
"President Bush - Upholding The.. .Protected Rights Of The Unborn." OTHER INDIVIDUAL PROTECTIVE RIGHTS LAWS"
"A BIGGER CHARITY", "The Easy and Harder To Do", "Leaders That People Really Want"
Featuring: "Word Of The United Worlds"
"MASTER BUILDER OF THE CONSTITUTION"
"State of The Union Speech/2006"
Enter the HTTP of this page.